For our tests we placed the speaker on a solid oak kitchen worktop treated with Danish oil. We subsequently tested the HomePod on other materials: the same wood that hadn't been treated with Danish oil and a regular lacquered desk and haven't seen the same issues. 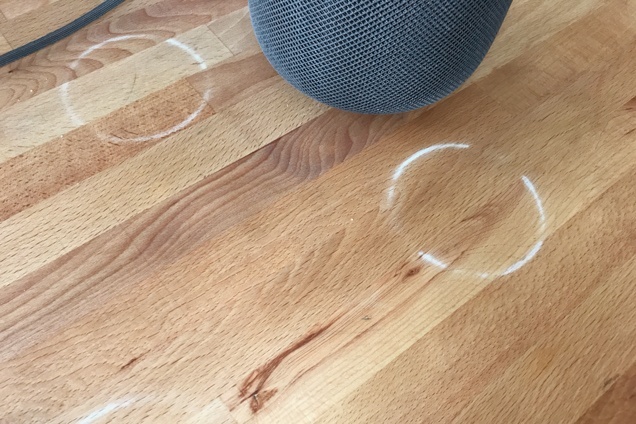 Apple told Pocket-lint that it is "not unusual" for a speaker with a silicone base to leave a "mild mark" when placed on certain oiled or waxed surfaces, suggesting the rings are caused by chemical interactions with treated wood. Apple told Wirecutter that "the marks can improve over several days after the speaker is removed from the wood surface." If not, Apple recommends "cleaning the surface with the manufacturer's suggested oiling method." 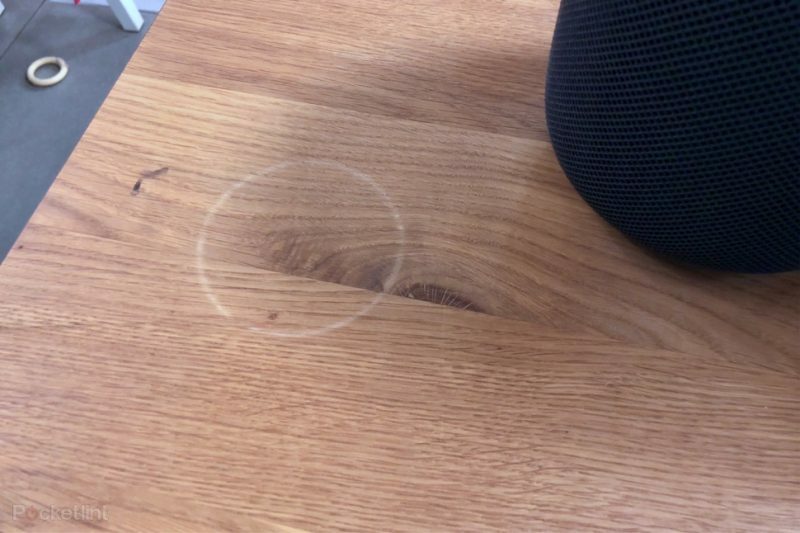 The HomePod can damage wood furniture: An unhappy discovery after we placed a HomePod on an oiled butcher-block countertop and later on a wooden side table was that it left a defined white ring in the surface. Other reviewers and owners have reported the same issue, which an Apple representative has confirmed. Apple says "the marks can improve over several days after the speaker is removed from the wood surface," and if they don’t fade on their own, you can basically just go refinish the furniture—the exact advice Apple gave in an email to Wirecutter was to "try cleaning the surface with the manufacturer's suggested oiling method." It's unclear at this point whether the issue is limited to treated wood, or if the problem could cause any sort of long-term damage to the HomePod's rubber base. For now, we would obviously recommend not placing your HomePod on a surface with an oil or wax finish if possible. Wirecutter conducted some additional testing and saw no visible damage when placing the HomePod on glass, granite countertop, nice fiberboard, polyurethane-sealed wood, and cheap IKEA bookcases. Update: Apple shared a "Cleaning and taking care of HomePod" support document that includes a section called "Where to place HomePod." This section includes details on the silicone base of the device and warns that it can cause marks on some wooden surfaces. Apple also suggests users avoid putting the HomePod near heat sources and liquids, and advises users that it can be cleaned with a damp cloth. That's why my family uses Adobe Photoshop for all of our household cleaning! Queue the doom and gloomers. Based on Apple's recent track record of releasing mediocre products, it may be warranted. Mark my words, unless there is a major shakeup in management and talent, Apple will begin to decline to Sony levels in 5 to 7 years. Remember how hot and untouchable Sony was back in the day? Then they started releasing crap products with little innovation and poor quality control, just like Apple is starting to do. Just you wait. This is the only way Apple can run rings round the competition nowadays it seems. Holding it wrong? Playing it wrong? iCoaster? I actually want circles on my furniture. I think my furniture looks better with the circle. Buy an HP and get a furniture tattoo for free. It's clearly the furniture's fault. Who buys wood furniture anymore anyway? What is this? the 1800s? That's what you get for buying cheap wooden furniture. Can I brand myself with an Apple circle if I lay down and set an HP on me for a few days? All ;) But the actual ADF responses are going to be entertaining for this one. So they couldn't have used a more inert material on the bottom of the homepod? This is what R&D and QC are for, to avoid silly things like this. Is this a huge, monumental issue? Not really, but this is one of those attention to detail things that Apple used to be a lot better at, and it doesn't do much against the argument that Apple has been slipping a bit lately. It's a nice antique table but it's got HomePod damage...the most I can give you for it is 20 bucks. Seriously... did we really think there wouldn’t be a major quality control issue of some kind after their recent poor performance in this respect? Surely they envisioned someone would place this on a wood surface, after all, isn’t that what’s in Apple Stores?